AFTERMATH: The injuries caused to Vinnie Hall and his father Michael. THE scars are horrific but thanks to a fleet-footed dad and an inate survivalist intuition, Vinnie Hall is on the road to recovery and telling the story about the day he was mauled by a kangaroo. Last weekend's attack on the three-year-old boy, and a growing number of reports of similar incidents, has prompted calls for the National Parks and Wildlife Service to investigate whether burgeoning kangaroo numbers on the Northern Beaches pose a threat to residents. 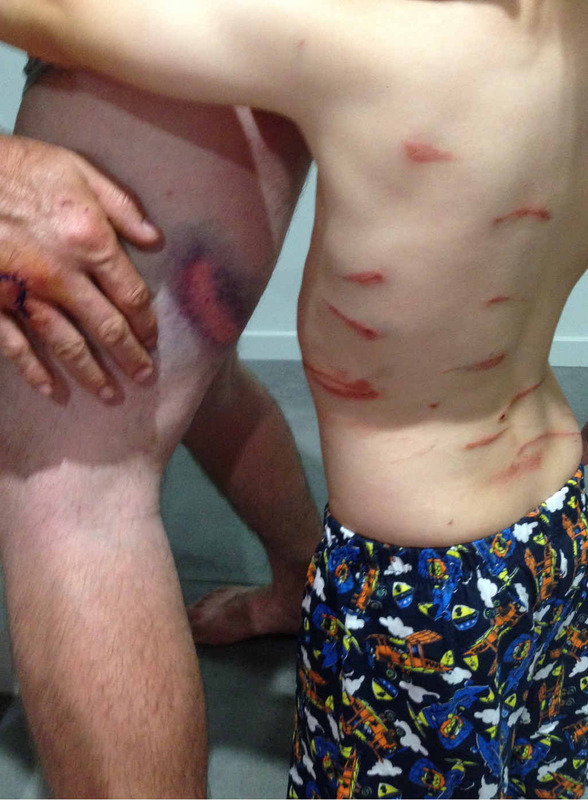 Little Vinnie was chasing a football only metres from his parents' house on their unfenced block when he was set upon. Hearing his cries for help, his father, Michael, put down the barbecue tongs and sprinted to his rescue. "Vinnie was only a few metres from me when he was attacked," Mr Hall said. "He had been knocked to the ground but luckily he rolled himself into a ball as the roo was on its tail and kicking him with its feet. "It ran away when I pushed it off him but then as I was comforting Vinnie it came back and attacked me. "In the end I literally had to pick it up and slam it to the ground to get it to stop." During that altercation Michaels' leg was badly bruised and a slash to his hand later required eight stitches. Vinnie's back bears a dozen scars. "Since the attack other people have told us about other rogue roos right across the Northern Beaches," Mr Hall said. "I've heard of runners being attacked and other kids being knocked to the ground." A NPWS spokseperson said rangers had spoken to the family to discuss options to reduce further incidents, including fencing, and will work with Coffs Harbour City Council on developing a kangaroo management plan for the area. Have you been attacked or menaced by a kangaroo? Email editor@coffscoastadvocate.com.au.